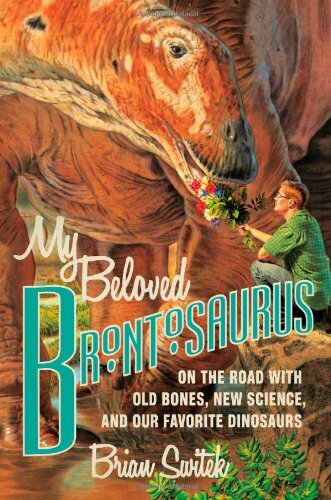 My Beloved Brontosaurus by Brian Switek book review. I have now come to the conclusion that most if not all of those Dinosaur Encyclopaedias that I got when I was a kid were outdated by the time they even got on the shelves. This is just one of the realisations I have come to after reading “My Beloved Brontosaurus” by Brian Switek. It’s a slim volume with dazzling cover art that realises every Dino fan’s most nurtured dream, the author crouching in the benign posture, with a bouquet of lush swamp flowers in his hand, and looking up with curiosity and affection at the giant head of an appreciative Brontosaurus that is gently taking the popular palaeontologists offering with the grateful sincerity I have often seen in doting horses. If you get the hardback edition then this touching cover folds out into a poster, that is double sided and shows the reality of the scene, as Brian looks on at a museum display in a vast grey hall, imagining the other side. It is lightly illustrated with some quirky black and whites, and each chapter has a nice National Geographic feature piece feel to it. You shouldn’t feel too sad about the duality of the cover though, because this is a wonderful book, and you will probably enjoy every page you turn to. The more modern history of the human race distracted me from my own Dino Mania sometime after 2005, (a subject I might well write about some time now I’ve read this), but re-caught the Mesozoic-palaeo bug (some of which you will literally encounter in these pages) sometime last year, after my latent Dinosaur interests slowly rebuilt itself. This book therefore is excellent for those of you who lost track of our scaly (and now not so scaly) friends and want to sit down and ask “So, what’s new?”. I must say I enjoyed catching up with my old compadres and meeting some new ones, through this book. Even though I was never a fan of Brontosaurus; I am much more of an Iguanodon man, and have been before they were movie stars in Disney’s Dinosaur. My own prejudice aside this is also a great book if you want a concise overview of how our view of Dinosaurs have changed from the 80’s (and sometimes a little further back) to 2012. That’s right, buy it fast, before this book, like all those sometimes poorly illustrated discount “Big Book” of Dino’s, too becomes outdated. What else is it? It’s a real Palaeontologist talking about his job, and his own personal journey from his first encounter with the late lamented “Brontosaurus” to now, along the way, Dinosaur enthusiasts will not fail to connect with his many stories of growing up with Dino culture, and seeing how both creature and human changed and grew alongside each other as ideas and conceptions changed. For those of us in Britain, this book, unlike the only other work of popular Palaeontology that I have ever seen in this country, (Dino Gangs), this little jaunt through time is going to have to be another dent in the mainstream book store market, as it is only available offline (that I have seen) in the US, for about $26, nevertheless I highly recommend it for those of you who now want a little bit more from your Dinos than the standard bargain, top trumps stat titles offer. Book Review: A Burnable Book by Bruce Holsinger. Book Review, Napoleon Soldier of Destiny by Michael Broers. Napoleon Soldier of Destiny by Michael Broers. The book is good quality, with an attractive cover, showing Raffles’ portrait, over a view of Singapore surrounded by lovely drawings of plants and birds, the title is written in red Victorian letters. One of the founders of the British Empire gets put back in the forefront in Victoria Glendenning’s new biography of Sir Stamford Raffles. For those of you who don’t know, Raffles was the founder of Singapore, but he was also a naturalist, collector, writer and governor of Java. Essentially he was one of those early Imperialists who did a bit of everything, defying simple definition. He didn’t come from anywhere special, he was the estranged son of a sea captain who was sent to work as a young man with the East India Company and from these humble beginnings he rose to do great things. Glendenning writes about Raffles with even handed affection, she obviously feels great sympathy for him, and indeed as she says his story is shot through with tragedy, though his end is hardly as tragic as one expects it to be. 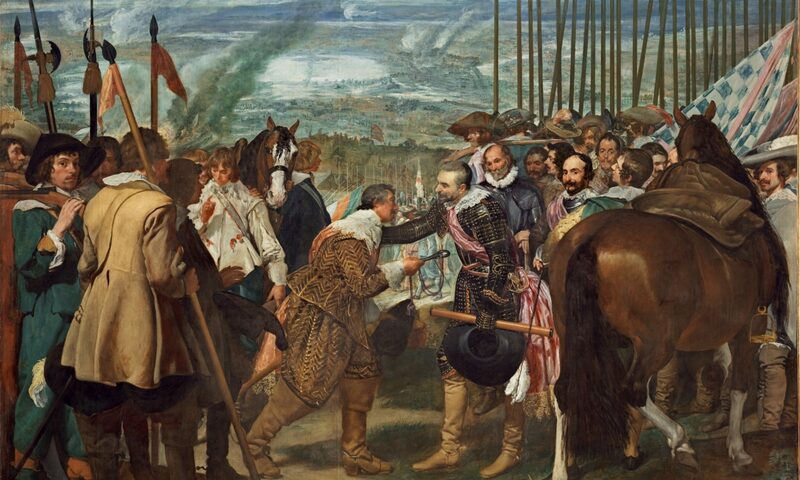 Everything his gone in to very nicely, the level of detail is good allowing you to reconstruct a picture of his life, see his enemies, friends, family and even servants in living colour. The insights into the workings of the East India Company are wonderful and were some of my favourite bits in the book, and seeing how small colonial towns were run was a great addition. The book also sheds light on a overlooked part of the Napoleonic wars, that being the “Eastern theatre” where the British were not only facing the French and their agents, but the Dutch and the native people’s who supported them. It covers the little known invasion of Java and introduces many fascinating characters, connecting the dots between the Maratha Wars in India and the further British conflicts out of India against the French and Dutch. The writing style is evocative and rich, it is essentially a tale well told and takes you like any food adventure book, to places you have never seen and shows you things you have never heard of. Sadly it is rather vague about the military operations, much like Julia Lovell in the Opium War, she has paid little attention to it, and as such the book suffers, now it’s a biography not a military history but since some incidents such as the invasion of Java (in 1811) is central to the story, it could have been a little more thorough. During the description of the invasion, for instance Glendinning mentions a fleet of 200 ships and an army of 12,000 men most of which were India, vague but not inexcusable, it is when she refers to Battleships instead of Ships of the Line, and East India Company Cruisers, which I cannot connect to any one class of ship then afloat, that I begin to start asking questions. Also, in this book, soldiers suffer, non more so perhaps than Colonel Rollo Gillespie, once called the bravest man in the British Army, is called a borderline psychopath by Glendenning, not knowing enough about Gillespie to comment on whether he was mentally ill, I will only say that I feel this to be a bit of a harsh and inaccurate appraisal of a talented, courageous officer who from my understanding showed no more cruelty in war than any other European did in the east. This also highlights a tendency with Glendenning to put her personal opinions forwards without necessarily telling us why. Gaps of information are also covered in that way obscure biographies do, by drawing on similar experiences of other unrelated people. So now on to factual errors, and yes I’m afraid there are some. I have written to the publishers in the hope of alerting them to the problem, or getting them to discuss them with me, but as of yet they have not responded. It was while describing one of Gillespie’s feats of bravery, many of which she finds far fetched, that the first factual error occurs. During the mutiny of Vellore in 1806 Glendinning explains that the sepoy’s of the garrison were stirred up by none other than Tipu Sultan of Mysore, who she says was a prisoner nearby. Unfortunately there is no doubt who she is talking about. Not to dwell too long on the subject of error, I feel it is my painful duty to inform other readers that Tipu, was not alive in 1806. The Tipu she is talking about was killed by the British during the final assault on his Capitol, Seringapatam, during the 4th Anglo Mysore War in 1799. It was Tipu’s children who were actually prisoners nearby and they are credited with stirring the pot. Other trivial things follow, little bugbears of mine that are almost shameful to write about for fear of being hopelessly picky, and they shouldn’t put you off. Things like describing Gillespie leading the remaining officers of Vellore in a Bayonet charge, the terminology is flawed, as there was actually a small command holding out under a sergeant until help arrived. Then there is the description of British soldiers clanking around in red coats and feathered helmets with naked sabres. Unless they are Heavy Dragoons or Life Guards, who were not serving in the east, no such Soldiers with that uniform existed in the British army of the period, either way she doesn’t explain. Had some more thorough research been done, perhaps with the help of a military historian, than these inaccuracies could have been avoided. Essentially the author has written a good biography of Raffles, with many sideline attractions that many will enjoy. A biography that shows him as a likeable, ambitious man that can relate to many people, a man who had a hard life with many ups and downs, who made a fare share of mistakes yet whose life was unquestionably important to the generations that followed. 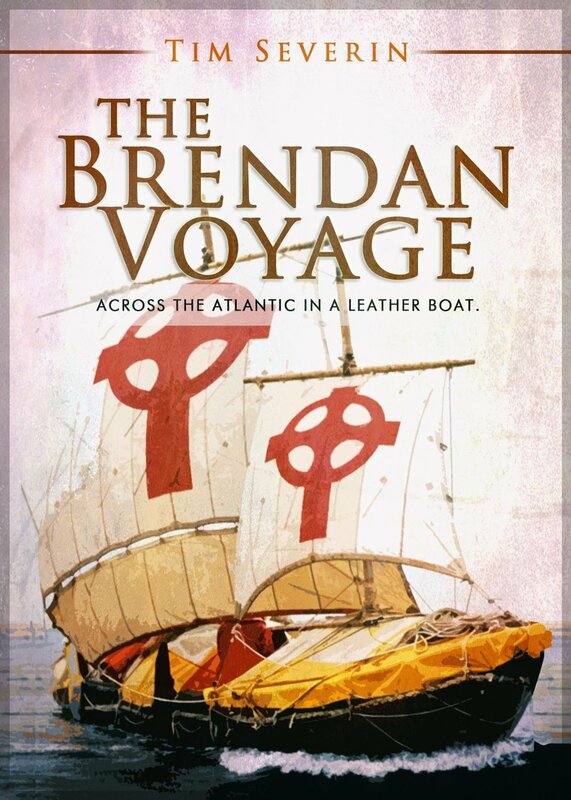 The Brendan voyage by Tim Severin E-book Review. Few books can claim to tell the story of a true Adventure in Historyland like the Brendan Voyage. Tim Severin’s record of his epic 1976-1977 crossing of the Atlantic in a small leather boat, to recreate the fabled voyage of St Brendan the Navigator, who was supposed to have landed in America before the Vikings. The subject is a great mix of adventure and history that will appeal to Traveler’s , historians, adventurers, archeologists and people who enjoy a story well told. It’s a modest size single volume of 234 pages with some helpful appendixes at the back, illustrated by seven interesting pictures. The cover is nice and grabbing, with a great picture of the leather boat Brendan, crossing a troubled sea. Severin’s quest to research and build the Brendan will be familiar to those of us who are obsessed with trying to tease out the mysteries of History from their long established hiding places. It starts with a quick dive into the adventure, then slams on the brakes and builds back up, but there is no vile tedium, just the loving detail of someone who is telling the story of something he has gone through. The part about the building of the Brendan is fascinating, and the whole book is pervaded with Severin’s deep knowledge of his subject. His prose is crisp and clear with a lively imagery and turn of phrase that is not at all pretentious, rather the whole takes on the spirit of a modern saga , rattling along with the enthusiasm and attention to detail of a natural story teller, mixed with a quasi romantic flair and sense of timing which betrays Severin’s talents as a novelist. It is an uncomplicated and largely uncluttered formula, which first and foremost tells the story by showing you what happened instead to trying to explain it, giving the whole an immediacy, and fast flowing narrative that is most attractive. One of the best parts of the tale is the description of the Brendan’s crew. Each individual is set apart from the other to be as instantly identifiable as a character from Robin Hood or King Arthur. They take on a wonderful reality that is at the same time almost too good to be true, making you wonder from time to time whether you are reading about real life people or something from an ancient legend. If this book had been a work of fiction then it would have been a testament to the imagination and skill of the writer, but any writer would have been hard pressed to imagine the tale, of luck, courage, comradeship, skill, bravery, considerable privation and at times just down right insanity that plays out across the book. Severin is an experienced seaman, but don’t be afraid that you’re going to get lost in allot of technical jargon, it’s very likely you won’t get everything, but even the most confirmed land lubbers will be able to gather what is going on. Their encounters with birds and Wales are breathtaking and unreal. The welcoming nature of the islanders they encountered is warm and comforting and the terror of the Greenland ice flows brings home just how dangerous the expedition was, it’s all here. Honestly I expected to find monotony, but though when becalmed Brendan’s crew suffered as much as any sailor does from boredom, the nature of the boat in question inclined to craft a story, more of constant activity and watchfulness than drudgery. Were in instances that to any other modern ship would have been crushingly boring to read about, when transposed to the leather hull of the boat that, by the end of the book even I had come to love, makes you feel that there weren’t many dull moments on the Brendan Voyage. This book will be an eye opener for those people not acquainted with the tales of the Irish monks that Christianised Britain. For it shows what type of men they were. Men of great faith, learning and piety, but also men of great skill, determination and bravery, whose scholarly and spiritual legacy often overshadows their tales of physical endurance and strength. I was struck by the great amount of luck “Brendan Luck” as Severin calls it, that accompanied the mission. Tough scrapes were turned into triumphs by sudden twists of fate, mistakes salvaged by the miraculous appearance of fishing boats and navy patrols, which needless to say the Irish monks could not have benefitted from, making the original premise of the voyage, just that much more amazing. This book is a testament to the bravery and skill of the crew of the modern Brendan who went into the unknown of long lost endeavours, and also to the mysterious monks who braved the forbidden seas and treacherous shores who distantly call back to us to believe their story, through their manuscripts and illuminated chronicles. In a way this book is a modern echo of their voices, carried far across time and sea, in a small leather boat called Brendan. Book Review: Conquistadors by Michael Wood. Book Review: The Time Travellers Guide To Medieval England. Book Review: Zulu Rising by Ian Knight.